The MIXXFM, Speedway Sedans Australia, National Production Sedan Title will be held this weekend at the Western Speedway, Hamilton, with Craig McAlister set to compete in his third consecutive National Title. 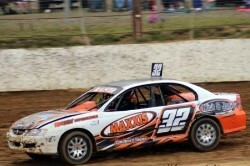 McAlister has been prominent in local racing and has learnt after last years title that reliability is the key. I think keeping reliability and a clean car for the final is the key, and go from there, said McAlister. Like many, McAlister has never raced at Hamilton, but can not wait for the weekend. I have never been to Hamilton or seen the track bit pumped for it, he said. Craig McAlister competed in the Victorian title and was at the top end of the field all weekend, finishing third in the A Main. I went well at the Victorian Title, with two heat wins and a third, starting pole, that was a massive effort, but went slightly backwards in the A Main, missing the jump and setup and finished third, he added. We have not made any significant changes, barely had time to do any, just a fresh set of tyres, wheel alignment and a bolt check, he said. McAlister believes it is any-ones title, and he is set to have a good crack and winning the title.